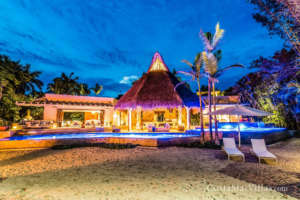 Casa Alamanda is a Fabulous ½ acre 9,500 sqft Estate nestled within the Lagos del Mar Enclave, inside the gates of the exclusive Punta Mita Resort. With a massive 85 foot infinity poolside space that offers incredible views of the Ocean and Puerto Vallarta in the distance, the villa’s serene outdoor setting features lush landscapes, expansive lawn and tropical gardens weaving throughout the property. 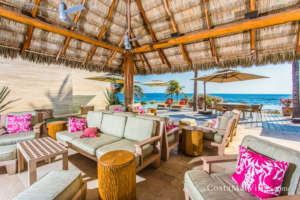 Casa Alamanda is the only home in Punta Mita that offers 310 degrees of ocean view. 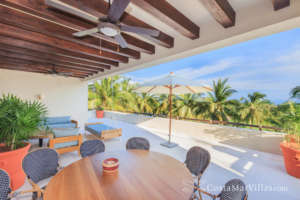 Designed by world famous Manuel Mestre, Casa Alamanda offers 2 unique living experiences by having individual living areas facing both North and South, allowing you to enjoy all that Punta Mita has to offer right from the comfort of your couch. Casa Alamanda features a total of 5 bedrooms and 6 bathrooms. Each of the villa’s four spacious and sophisticated suites features its own spectacular views, private lanais, king or dual queen beds, High Definition Shaw satellite service, individual bath and shower facilities, luxurious Egyptian cotton sheets, air-conditioning, daily turn down service and much more. Our Nanny’s quarters is a full featured bedroom with it’s own bath and air conditioning. Impeccably decorated, each suite is marvelously outfitted with select Mahogany wood, marble and onyx throughout. Wireless is also available throughout.